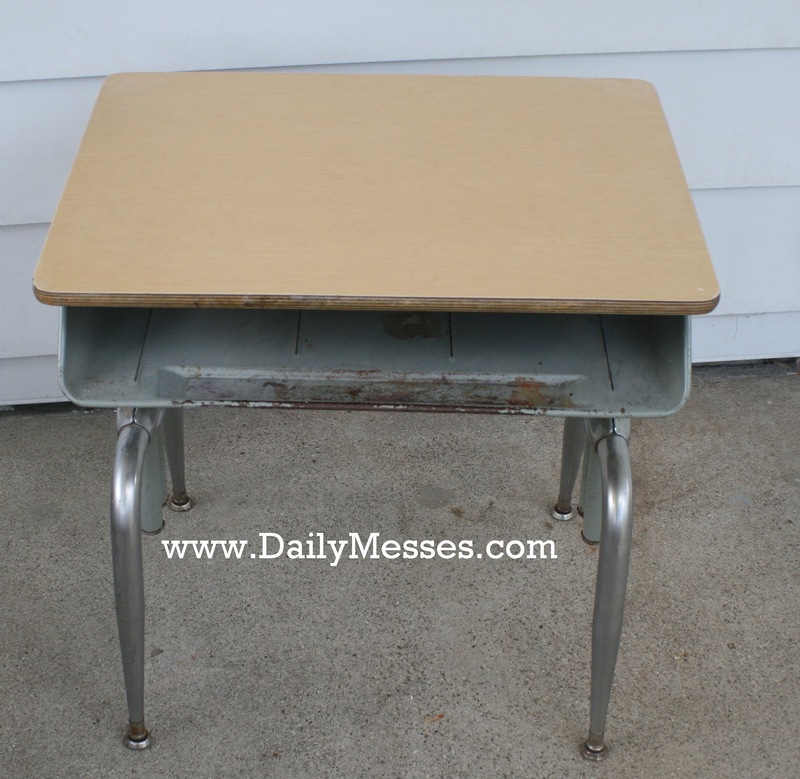 *After seeing a few old school desks at garage sales, I thought I would repost this older craft post. 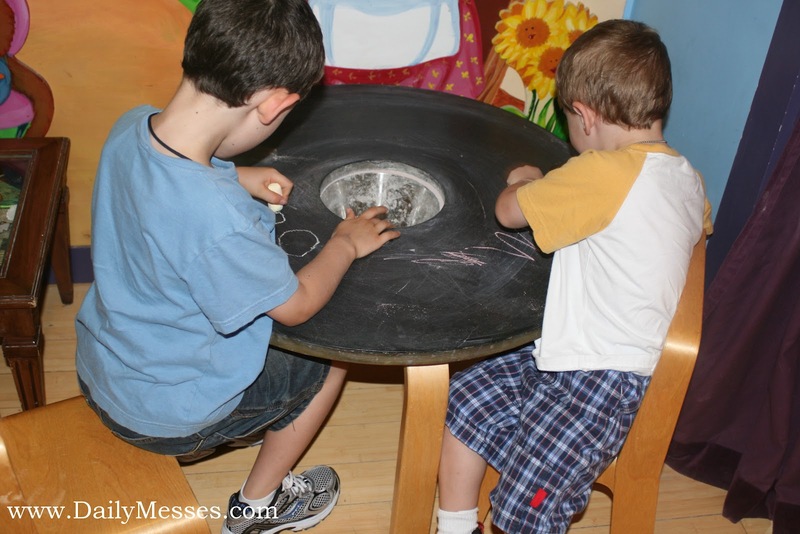 I saw a really cute idea at a local children's bookstore for a chalk table. I wanted to try it, but didn't want to ruin the kids perfectly good picnic table, so I was on the look out at garage sales. I came across this little school desk and got it for $5! 2. 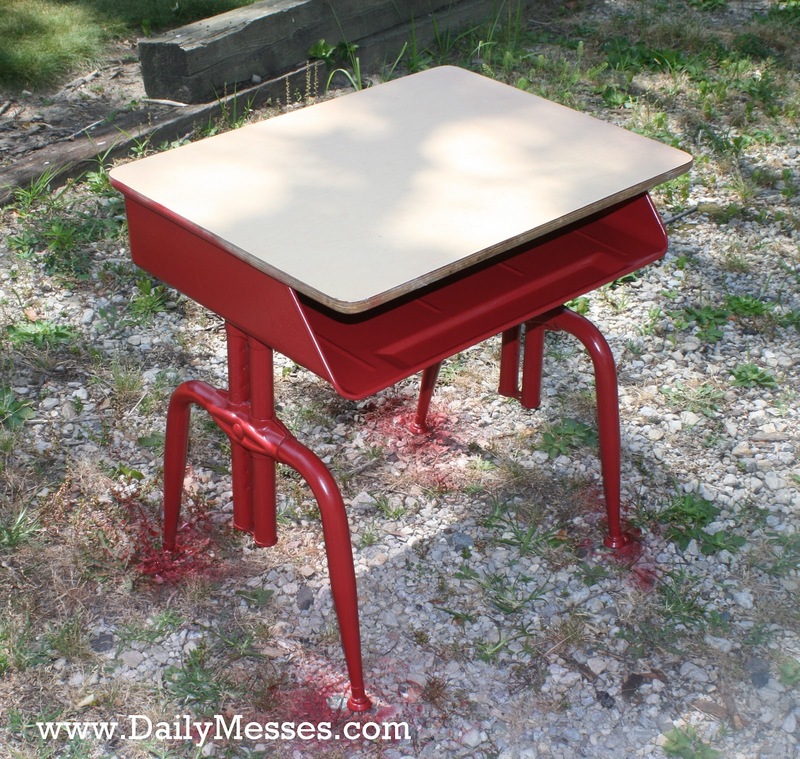 Took desk home and sanded off some of the small rust spots. 3. I also sanded the top of the desk to get rid of any finish that was left. 4. 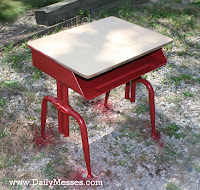 I used an enamel spray paint for metal and painted the legs and drawer area of the desk. I wasn't sure if it was going to live inside or outside yet and wanted it to be protected against rusting. I already had the spray paint, but you can get it at local hardware/home improvement stores. Sometimes a Meijer type of grocery store or Wal-Mart will carry it as well. It usually is about $4 for a can. 6. 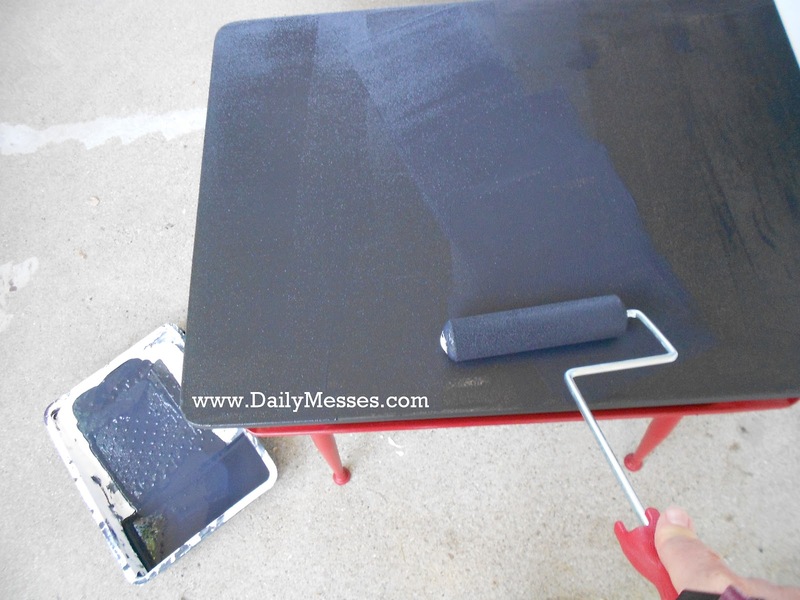 I bought the Rust-Oleum Chalkboard Paint. You can buy it at Amazon.com or local hardware or paint stores often carry it. 7. I put on 3 or 4 layers of the paint and let dry (letting the paint dry between each coat). The paint instructions said to let the paint set for 3 days before using! 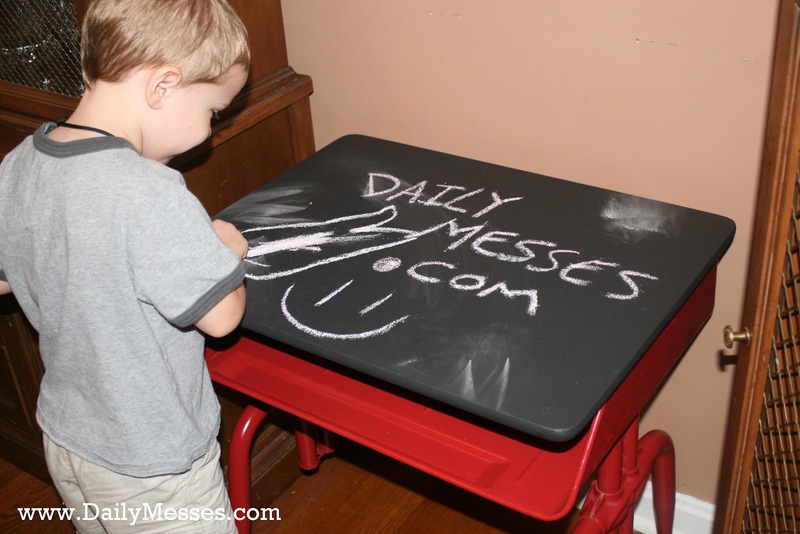 If you don't want to do a desk, you can also do an old mirror, back of the playroom or bedroom door, or even their wall! 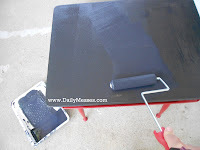 If you are going to do an upright surface, like a door, you might want to use the Magnetic Primer! That way they can stick magnets to their door and use chalk. Rust-Oleum also sells a Dry Erase Paint (from what I read, the Dry Erase paint only has a shelf life of 2 years. If you buy an older can, it won't work as well. The date is on the bottom of the can). I haven't tried the Magnetic Paint or Dry Erase Paint, but they did look super neat. with a basket insert for the chalk.